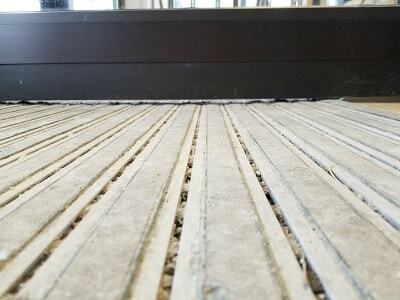 Mat wells may not be regularly maintained simply because it can be very difficult to remove the heavy metal grating, or it has corroded in to the side walls and requires specialized tools to access, and the dirt is often hidden below the grates, out of sight and mind. When neglected, mat wells can begin to degrade beneath the surface, eventually collapsing or causing structural damage to the entrance area. This is typically due to a build up of salt residue combined with moisture, promoting accelerated metal corrosion and concrete deterioration. A thorough cleaning of mat wells twice per year – spring and fall – along with a comprehensive inspection of their condition will help extend the life and functionality of the well. Using a vacuum system, remove all the loose dust and debris, then gently scape out the built-up salt and dirt residue, while wearing protective eye wear and an appropriate face mask. 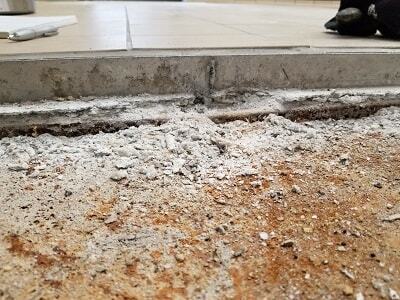 Once complete, rinse the well using a neutralizer, then dry it completely before replacing the grating. 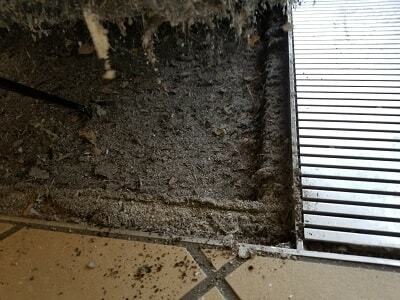 Don’t forget to also clean the surface grating system with a scrub tool or a pressure wash system. We recommend applying a waterproofing membrane to the clean mat well, which will protect the structure from water and salt damage and extend the life of the well. 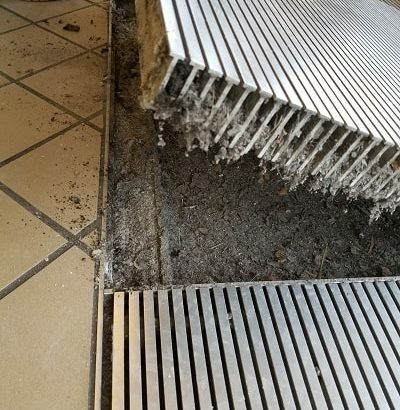 One of the least observed or appreciated tools your facility has in the battle of cleanliness is the under-rated and often loathed mat well grating system. Lately, we have seen a huge growth in addressing problems with mat wells in buildings and in public transit locations. 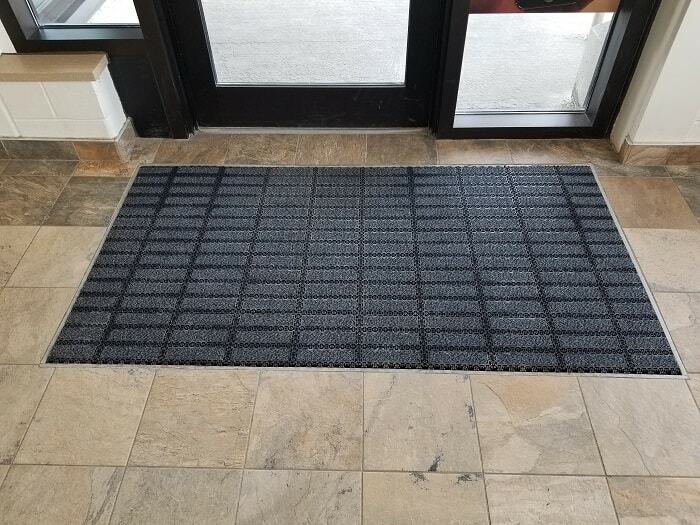 Mat wells are often designed with a shallow tray of aluminum or concrete with a scrub grating placed on top, designed to capture the dirt and moisture that gets tracked into buildings. Sometimes, they have a deep tray or even a drain grate in the bottom to allow for cleaning or for the excess water to be collected. Typically, these wells are often ignored; either because we don’t think about them very much, or because the dirt collected under them is disgusting to look at, smell, or touch. That’s exactly what a mat well is for – catching and holding all the dirt and moisture that would otherwise be tracked in to the building. Once this level of degradation occurs, the well may require costly removal and replacement, and create a hazard for unaware pedestrians. The residual debris in these wells can also develop mold and other respiratory issues for people using these facilities and promoting the spread of harmful airborne pollutants. The good news is that with proper maintenance and the right grating system in place, mat wells can be a very effective way to reduce the spread of floor pollution into a facility, and act as a trap for larger particles that can damage your floors. This is also a good time to look at the condition of the surface of the grating to ensure that it is not worn or damaged. This is the time to look at replacing the aluminum or pedi-grid style material for something that is easier to work with and offers a better cleaning surface. Aluminum grating systems are rugged, but can corrode, are heavy and expensive to install and replace, and can create their own slip-hazards when wet. A proper scrubbing material that is more resistant to corrosion and is light-weight and easy to clean is worth looking in to. When properly serviced and maintained, and the correct surface materials are installed, mat wells offer a clean, secure and effective cleaning service, 24/7. Copyright © 2018 Rismat Floorguard. All rights are reserved.